To celebrate the launch of the National Youth Jazz Orchestra Academies in Lancashire and Cumbria, the full NYJO ensemble will be performing live at the Great Hall, Lancaster University. 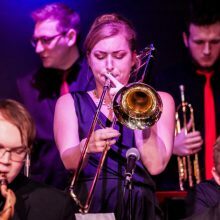 NYJO is a glittering showcase for the UK’s finest young professional jazz musicians, combining a hard-swinging rhythm section and a raft of hugely talented soloists, to bring you the very best in British big-band jazz. Under the Artistic Direction of Mark Armstrong, the 23-piece orchestra perform around 40 concerts a year nationally and internationally, and aim to inspire the next generation of young jazz musicians with education work . Over its 53-year history, NYJO has helped launch the careers of many of the country’s most renowned jazz musicians including Guy Barker, Amy Winehouse, Mark Nightingale and Mercury Award nominee Laura Jurd. In tonight’s concert, expect a variety of well-known jazz classics alongside new brand commissions from some of today’s most exciting composers in the genre. Tonight’s concert will kick-off with a short performance from some of the the talented young jazzers from the NYJO Regional Academies in Cumbria & Lancashire.